On May 24, 2008, in a Test match at Sabina Park, Shivnarine Chanderpaul was struck on the back of the head by a bouncer from Brett Lee and, for a short while, was knocked unconscious. On the video, the commentators talk over the pictures. 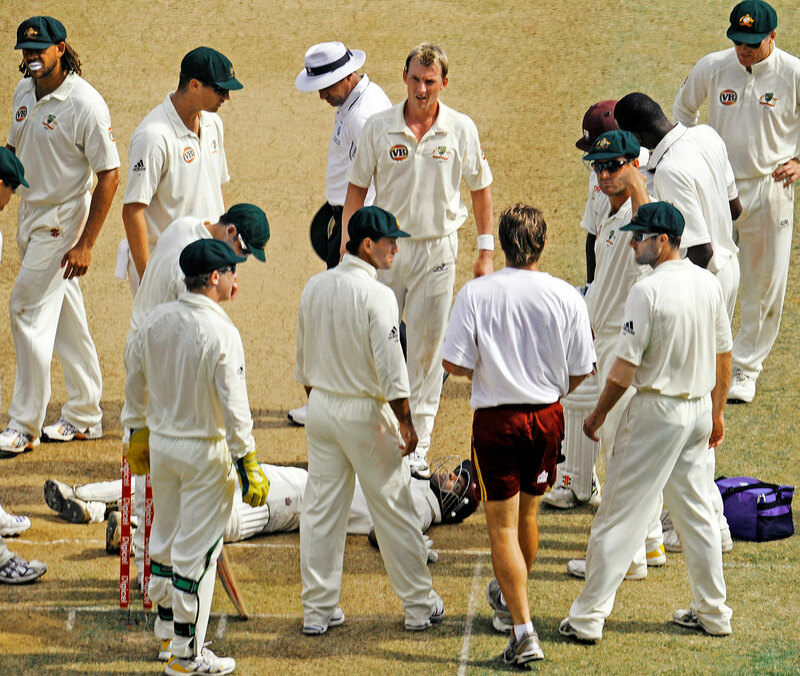 "Chanderpaul is floored… might just be unconscious here, cracked on the back of the helmet, he went down in a heap." "Well, he hasn't moved, almost ducked into that bouncer from Brett Lee. Down right away." "I reckon he was out just about as it hit him, hit him on the back of the head." As Chanderpaul gets to his feet, the commentary turns jocular. "Where am I? What's the score? More importantly, how many am I?" We are told he is 86 not out and we see the crowd applauding. Chanderpaul was to complete his typically "battling" century, and later give reporters what now reads like a chilling account. "I did not know where I was. My entire body went numb… I could not move my hands and I could not move my feet." He then eased into a more familiar, comforting narrative. "However, I told myself if I left the field we would have been in a bad state." On September 13 this year, in a series-deciding game at Old Trafford, England ODI captain Eoin Morgan ducked into a bouncer from Mitchell Starc and was hit on the head, near the right temple. The crowd gasps. 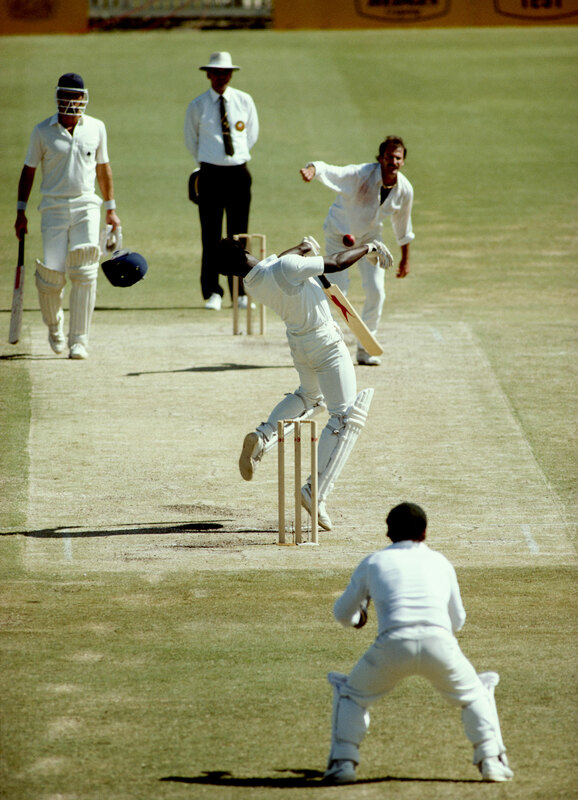 Michael Holding says, "Oh whoa, that's dangerous." There is silence for close to 20 seconds as the Australians rush to Morgan. A shaken Starc has his hand on Morgan's shoulder and Steven Smith gestures for the medics. Morgan has dropped his bat, his head is bowed, and the physio runs over. Finally Holding speaks, "That's hit him flush." As Morgan takes off his helmet, David Lloyd offers more words: "Anxious moments." The physio examines Morgan's head as he talks to him. Holding's words are measured: "Think best have a look, stabilise him and take him off, I think, get it checked, don't run risks with that part of the body." A doctor has joined the physio and two England substitutes. As Morgan walks off the field, there is a smattering of applause from the crowd and a few Australian players. Between Chanderpaul and Morgan, cricket has been forced to realign some of its traditional beliefs and accept that the ground beneath its feet has shifted. It is a little less secure, less rooted in certainties. It is now aware that under normally sure footing a crevasse can open up unexpected. The edge of the abyss is closer than previously understood. It has been a year since the death of Phillip Hughes due to an "extremely rare condition" - in medical terms: "a vertebral artery dissection, leading to subarachnoid haemorrhage". Of 100 reported cases of this injury - an arterial rupture caused by blunt force trauma to the back of the neck - there was, according to Cricket Australia team doctor Peter Brukner, only one inflicted by a cricket ball: this one. The one that took the life of a bright young man, a son, a brother, a friend, a cricketer. Twelve months on, let it be said straight up that cricket has not become kinder, gentler, or indeed, more genteel. Before every "marquee" series familiar tropes are pulled out from the "mental disintegration" dictionary - aggression, attacking cricket and playing it hard (but fair). The 2015 Ashes was total trash-talk panto - puerile, predictable. Morgan's injury was to provide a sombre reminder that cricket must now deal with a truth previously never foremost in the mind. That in a sport where the only adversarial point of contact is meant to be bat on ball - where the greatest adventure appears to involve diving, leaping, tumbling for a catch or completing a sharp single - an injury could spell death. The list of cricketers who have died on the field is relatively short in a sport that, at its international level, is almost 140 years old. Wilf Slack, Wasim Raja, Raman Lamba - these were familiar names to living generations, their memory still causing a tug in the throat and a wrench in the heart. Cricket's fragility may never be far away from its surface but Hughes' death, in an age of television and social media, became an amplifier of the game's ability to contain within it the terrifying possibility of the end of a life. "I think all international cricketers played thinking, 'I might get hurt but no one will be killed,' said former Australian captain Ian Chappell. "After the Phil Hughes tragedy we now know that's not true." "It can't be done. They want us to make something that can withstand half a house brick at a hundred miles an hour." Around 40 years ago, at Lord's in 1976, England opener Dennis Amiss ducked into a bouncer and was hit on the back of his head, he says, "an inch away from the main artery that Phillip Hughes was hit on". Today, if he reaches out to his neck he can still feel the dent. That inch was to be everything. "I thought the game had changed inasmuch as there were a lot more bowlers who were bowling faster - 90mph - than before." In the previous season Amiss had faced Dennis Lillee and Jeff Thomson on rock-hard Australian wickets. But when Kerry Packer invited him to join World Series Cricket (WSC), Amiss knew he would be travelling as a 34-year opener to a competition that had "18 fast bowlers who could bowl 90-plus mph… I thought if I were to carry on playing I had to do something". The thought led Amiss to become the first man in cricket to seek a way to protect his head. He reached out to a motorcycle-helmet manufacturer in Birmingham who produced a modified helmet made of Kevlar over conventional fibreglass with a polycarbonate visor. It was believed, Amiss says, that it "would take a double-barrelled shotgun from ten paces. So I thought it could take a cricket ball from 22 paces." The WSC's advertising had built up the "Super Tests" as a gladiatorial confrontation between fast bowling superstars and attacking batsmen. The sight of a "crash" helmet as cricketing innovation fit that image. Within a month of WSC, though, the helmet was beginning to be seen as a necessity, especially after a young, blond Australian barnstormer, David Hookes, was socked on the side of the face by Andy Roberts. Before firing in the lethal delivery, Roberts had bowled what Hookes, writing in Hookesy, called a "pretty ordinary bouncer", leaving him to conclude that Roberts "didn't have 'much left' in him. I thought, if he lets one go around the spot, I'll have a dash at it." Two balls later a bouncer "pitched similarly and I swung at it with all I was worth". To Roberts, Hookes was, "young and cocky". He had been "hitting boundaries and signalling boundaries… And he was taking on everyone and everything," he told the Cricket Monthly. "He appeared as though he was in a mood to destroy our attack. And I was justified in bowling the bouncer." Many who faced Roberts say he had two bouncers. Former New Zealand opener John Wright says, "The slow one and the quick one. If you messed up, he could hit you. I did twice in one innings. He was bloody quick and accurate." That ball Hookes hooked and missed was the faster climber, Roberts said. Hookes wrote: "It smashed into my jaw. It didn't hurt initially. It just shocked me and the left side of my face fell numb." Roberts remembers the moment. "At first it never looked as if it was a serious incident because he was standing, and then he just fell down." Hookes walked off the Sydney Showground, his jaw broken, a piece of bone later found in the towel that was wrapped around his head. Packer, who was taking on the establishment, wanted his high-value players protected. So he reached out immediately, as Gideon Haigh writes in The Cricket War, across the miles to Amiss' Birmingham helmet-maker and ordered a large consignment. When news of the big order went out, Coonan & Denlay (C&D), who manufactured equestrian helmets and headgear for rugby and waterskiing, asked WSC if they could make a helmet for cricket. Rod Marsh and Austin Roberston, a former Aussie Rules player who was Packer's right-hand man, met C&D representative Tony Wallace to explain what cricketers needed. Wallace told C&D owner Tony Henson: "It can't be done. They want us to make something that can withstand half a house brick at a hundred miles an hour." Helmet manufacture has moved further and beyond that gloomy pronouncement almost four decades ago, with lighter material and better protection. But cricket's "red zone" - the element of danger to the batsman's head - has stayed the same. If force is mass times acceleration, cricket is that Newtonian law sprung to life. When sent down by an express fast bowler the cricket ball contains enough mass - weighing between 155.9 and 163 grams - and speeds between 140kph and 160kph. By the time it reaches the batsman the ball will, most times, have pitched and dropped in speed, scientists say, by approximately 10% of what it registered on the speed gun when it leaves the bowler's hand. It still carries in it, though, the force contained in "half a house brick" hurled at the head. "The Phillip Hughes tragedy has transformed the landscape." The possibility of damage that a cricket ball can inflict remains one of the game's most acute medical issues. 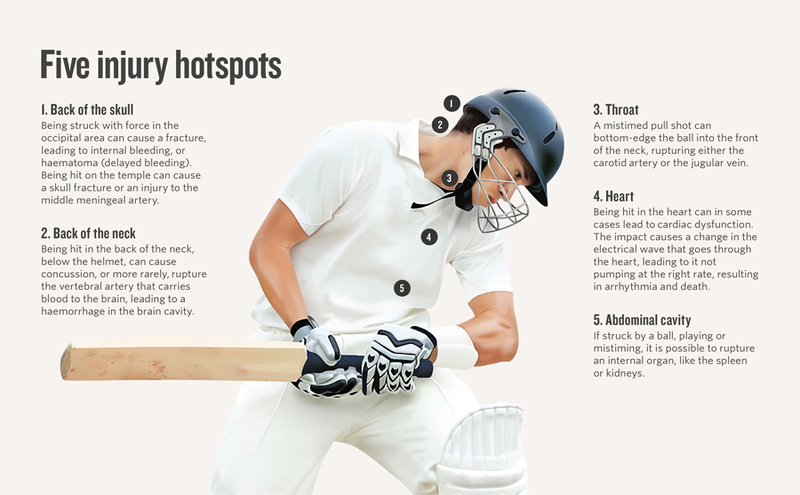 The ECB's chief medical officer, Dr Nick Peirce, told the Cricket Monthly that while fatality is the ultimate risk in any sport, its governors ask themselves two questions: "So do you have a sport where death is a common occurrence or a likely occurrence or a possible occurrence? Is the risk of death proportionate to the playing of the game?" Cricket had, Peirce says, mostly "assumed that we had a sport that perhaps underestimated or indeed perhaps didn't really think it had any risk". The Hughes tragedy "has transformed the landscape somewhat… People's attention has been heightened." The game's biggest risks for fatal injuries lie in either "a head injury or a blow to the chest, which causes the heart to go into arrhythmia (irregular heartbeat)". According to Peirce these extreme cases are important because when compared to other sports, both contact and non-contact, "the risks are relatively low in cricket". While in theory, he says, "it is possible to rupture an internal organ [when struck by a cricket ball] fatalities have not been reported". Apart from blows to the head and chest, the game has injuries that are "non-fatal, but they still have to be prevented because they cause morbidity, they cause pain, they cause discomfort and they can still threaten someone's career. The injuries that now form part of the new British Standard helmets requirements [put in place in 2013] are injuries to the face, eyeballs, eye sockets, teeth." Wicketkeepers are more vulnerable to facial injuries than batsmen, particularly when standing up to spinners. Mark Boucher's illustrious career came to an end when a flying bail lacerated an eyeball during South Africa's 2012 tour of England. Former India wicketkeeper and current national selector Syed Saba Karim was keeping to Anil Kumble in the Asia Cup in Dhaka in 2000 when a faster one snapped at the flap of Habibul Bashar's pad and hit Karim flush in the right eye. He returned to the game after undergoing surgery but found he was struggling to gauge the speed of the ball. His first Test, played later that year, was also his last. Neither Boucher nor Karim were wearing helmets, whose grilles can protect wicketkeepers against uneven bounce. 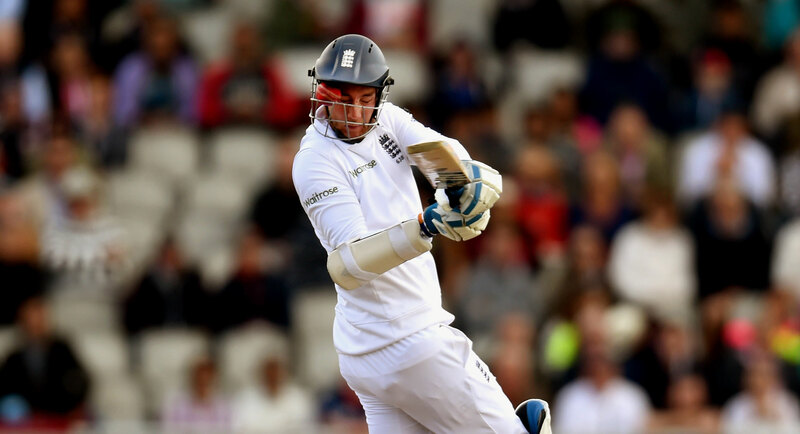 The grille did not however protect young England wicketkeeper-batsman Craig Kieswetter as much as it was meant to. In July 2014, a ball from David Willey burst through Kieswetter's grille, breaking his nose and fracturing the part of the cheekbone that formed his eye socket. In keeping with the times, he posted a horrific selfie of his battered face for the world to see. When he returned two months later he felt the impact of the injury was deeper than he - or anyone else - had anticipated. "As soon as I played under lights, I was in trouble," he told ESPNcricinfo in June. "I couldn't see the ball in the field, couldn't see the ball when I batted. The ball was coming down at 90mph and I couldn't see it." He quit the game in the summer of 2015. "I know I can't play at the same level I want to," he said. "I liked being a swashbuckling player. And I felt I had the talent to play for England. I don't feel that way anymore. I'm not the same player, I'm not as good as I want to be and I can never be." "That is the function of the batsman. He has to protect himself." At the top of his run-up stands the fast bowler with one thing on his mind. Not the "kill, kill" of the crowds from the 1970s, but a cold resolve to ensure that, as Roberts says: "No fast bowler should allow the batsman to get the better of him." No matter what has happened in the game, the belting he may have received, every bowler begins a new spell with Roberts' mantra in mind. In the weeks following Hughes' death, Mitchell Johnson admitted that he had lost a bit of his sting. "I wasn't probably fully right, mentally right," he told ABC in June. His team-mate Pat Cummins said he "couldn't even fathom bowling a bouncer" in the first couple of weeks. "I certainly think it is on the back of most people's minds." Early in November, Chris Rogers spoke of the change in mindset around the world. "I just think we thought we were invincible," Rogers said while commentating for ABC Grandstand. "It took that incident to really put things in perspective." Despite frequent injuries to batsmen, most modern fast bowlers have tried to stay true to their trade. Varun Aaron, whose bouncer crashed through Stuart Broad's grille and broke his nose in August last year, says he later went to the English dressing room to check on Broad. "I did feel bad for him, I went and checked and saw he was okay. It happened by chance, it wasn't that I was out there to smash him." The bouncer, says Aaron, must always remain a "weapon" for quick bowlers. "You have to use it to push the batsman on the back foot, you don't want him on the front foot. More than anything else, it is intended to put a doubt in the batsman's head." Roberts was asked whether a batsman ever told him that he was dangerous-scary. His reply was droll: "Well, I thought I was scary most days." Doubt over fear? Fear over doubt? Whatever works. To Roberts, the anxiety about hitting a batsman badly "never entered my mind at all. As a fast bowler if you start thinking that somebody is going to get hurt, it means you are going to be less effective." It would have translated into a drop in pace, or to "try to do everything in order for somebody not to get hurt". That, he firmly believes, "is the function of the batsman. He has to protect himself. Hitting a batsman was never intentional." Growing up playing schools cricket in the 1950s, former England captain Mike Brearley says he "hardly" faced a bouncer. "I don't remember any talk of how to play it." 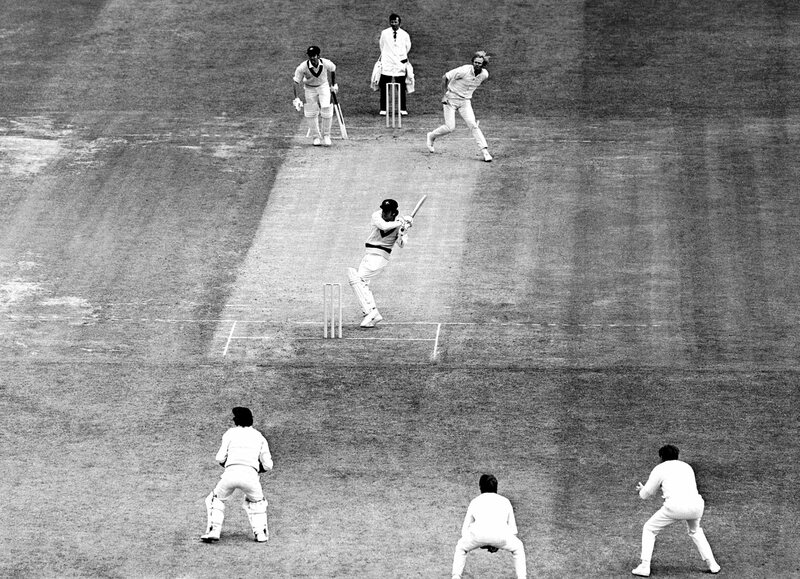 The first experience of a "bowler on a bouncy pitch and suddenly all was different." Until then, the short ball was thought of "as balls to be hit until they reached a certain speed and height and then you fended it as best you could". The Chappell brothers learnt their cricket with, Greg Chappell says, instruction from their father. "That we had a bat in our hands for one reason and one reason alone - to score runs with. I don't think you can play at that level if you had those thoughts [of getting hit]… I never thought bowlers were intentionally trying to target my head. They were trying to unnerve you… "
The fear in batting for most batsmen, says Wright, "is the fear of failure, not the fear of getting hit. If you had that [fear of getting hit], you were finished… You just want to get behind the ball and have that feeling that if you are going to get me out, you have to knock me out. You drop your hands and take something on your chest." "You always knew when you screwed up. The moment of impact was always the split second after you realised you had made that mistake. In fact it was that quick that you really didn't have time to gather your thoughts at all. You always knew when you'd taken your eye off the ball, that Christ, you'd turned away." For Roberts physical damage was never meant to be part of his métier. "I don't want to hurt anybody. I just want to get wickets... I never minded if a batsman feared [me] as long as he gives up his wicket. I believe that I got a few wickets because of batsmen being scared." Fear? Doubt? Whatever works. It has stayed the same, says Pakistani fast bowler Wahab Riaz, a conveyor of stinging short balls and a left-armer's snaking yorker. "When we are inside the ground, we don't feel anything, we don't think about what has happened [with other batsmen], there is nothing on our mind except the batsman we have to bowl to. "Phil Hughes was a very, very sad incident. It was a terrible accident. But you can't have anything at the back of your mind when you are going to bowl." Wahab says a fast bowler's aggression is tied in to the bouncer being his main weapon. "How can we leave it? This is what we do. We are fast bowlers, and in your mind, you want to attack, you have to attack. The bouncer is our strength at some times. Why would we not want to bowl that? It doesn't mean we want to kill a batsman, we want to use what is our strength." A bowler who claims he runs up trying to hit batsmen, Holding says, "is either sadistic or he is lying… If you are saying you are bowling to hit someone, you should be in a boxing ring. You shouldn't be playing cricket." "As long as my head is still, my hands are back and ready to hit the ball, and my eyes are on the ball, what goes on before that is irrelevant." Between the death of Abdul Aziz, a 19-year-old Pakistani hit on the chest while batting in Karachi in 1959, and the medically inexplicable passing of former England opener Wilf Slack in 1989, there lie three decades. There was an increase in the quality of fast bowling in this period (despite bowlers no longer having the advantages of the back-foot no-ball rule). 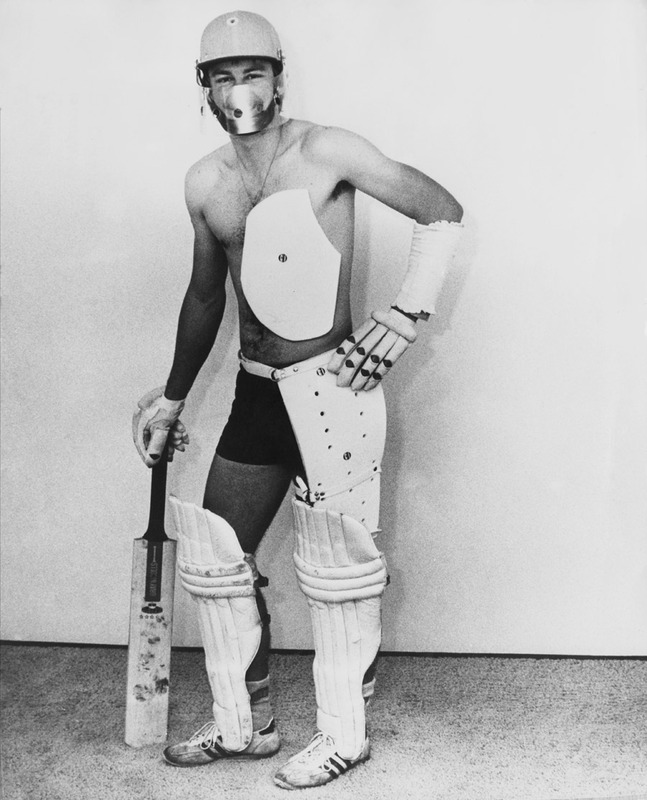 Batsmen only had access to headgear in the late 1970s. That three decades went by without a cricketing death could be either sheer good fortune or because batsmen were aware of the consequences of failing to watch the ball closely, an instinct hardwired into every batsman who played on uncovered wickets, which were on their way out in that period. The list of injuries and deaths that have shadowed the sport since the arrival of the helmet has led to a rumbling: that while most great modern batsmen would have managed fine in the pre-helmet era, the helmet created a generation of in-betweeners who cashed in to become modern-day bludgeoners, technically incomplete but extremely successful. Roberts believes that since post-1990s batsmen used protection from an early age, "they never had a chance to cope with short-pitched bowling without protective gear". He says it has reduced their range of options in terms of how to handle the short ball. "I am quite sure more people are being hit since the introduction of protective gear. A lot more people. They take their eyes off the ball. Most batsmen these days get hit flush on. Flush on. Because they don't move in line. A good player of short-pitched bowling will move himself in line or outside the line by having his weight evenly balanced." The majority of the batsmen today, he says, "lunge forward" as their first movement, "which is not the correct way to play short-pitched bowling". The orthodox way to handle the short ball, taught to batsmen growing up in the '60s when Greg Chappell began, was by being clear about "the positioning of the head". "The basic rule I was taught was: the full ball, you wanted to keep it on the off side of your front leg, the short ball you wanted to keep on the leg side of your head. Just make sure you weren't playing with the head in line with the short ball." Cricketers starting out in the '80s took to the game with reduced dangers and therefore "it is less important for players to position themselves well because they have got that protection". Despite the lack of a correct defensive technique, what the batsmen are able to do now is to respond to any short ball with the confidence that they will not be hurt. In the Daily Telegraph Geoff Boycott wrote of batsmen feeling safe enough to "attempt to either pull or hook almost every short ball that is bowled at them". The hook shot, though, while not quite extinct, is a lot rarer. Few batsmen produce it with alacrity, and the urge to get on the front foot has mixed up the biomechanical responses required to execute the stroke. Getting on the front foot, says Ian Chappell, "makes it almost impossible to get inside the line of the ball when hooking, a must to make the shot safer". Hooking from that front foot can lead to batsmen averting their eyes, he says, almost by reflex. "The safest and best way to hook is from inside the line of flight; that way you'll only be hit if you edge the ball into your head." The best practitioners of the shot didn't get hit "because to play the shot well you have to watch the ball very closely. It's the players who turn their head that get hit, because they are then relying on the ball missing them." He says he always preferred getting into a position "where it was me who was avoiding the ball". Watching the ball was a simple and fundamental tenet in batsmanship. Uncovered wickets and the uncovered head made the consequences of failing to do so at best humiliating, at worst fatal. The modern-day batsman, if not quite completely bulletproof, knows he can rush through with feet and hands and deal with the after-effects of a ball rearing at his head, whether that is by ducking or getting hit flush on the helmet. To borrow from Star Wars terminology, the modern-day batsman uses his helmet as a deflector-shield and the thick bat as his lightsabre. They have stretched his imagination and given him the capacity to improvise and reinvent, to expand the geometry of the game from its more conventional angles of a "V" to using the field's 360-degree arc. Think lap shot: Brendon McCullum getting outside the line, going on his haunches and scooping over the wicketkeeper's head against Shaun Tait bowling close to 150kph in a T20I in Christchurch in 2010. Or AB de Villiers' highly original "fadeaway" slog sweep played to the fast bowler by virtually falling over on one knee. Where footwork through the crease was once precise, measured, certain, it is now far more fluid, quicksilver. The best modern batsmen make maximum and varied use of the corners of the crease like dancers do their stage, turning into Baryshnikovs on the cricket field. The contemporary batsmen argue that however different their responses to the short ball are or what their initial movements are, the fundamentals do not ever change. McCullum talks of the importance of "keeping still at the point of impact". "As long as my head is still, my hands are back and ready to hit the ball, and my eyes are on the ball - the three fundamentals - what goes on before that is irrelevant," he told ESPNcricinfo in 2012. The mass of movement is "more to try and mess with the bowler's head a little bit. Again, it does not always come off but sometimes it is required." With its requirement of constant attack, T20 has pushed a batsman's confidence towards diving into risks he knows he must take. McCullum says the format has gone through a "fairly quick evolution", far beyond the hit-and-giggle of its early years. "There is a lot more seriousness about it now. People's understanding of how to play the game has definitely developed." Wright, now a coach across all formats, appreciates the technical dexterity of the modern batsman. "Some of the shots these boys play nowadays, the way they must be able to watch the ball to manufacture shots we never even dreamed about. McCullum or de Villiers… that takes a lot of guts no matter what you are wearing. "I don't necessarily agree that young batters get it easy and get onto the front foot. You can only play what's bowled in front of you. In T20, the batters these days have got the ability to get outside the line of the ball and smash it over the covers. Their shot-making through the off side is fantastic." The limited-overs game with its limited bouncer rules have resulted in "much less leaving of the ball. A lot of the balls we would leave, these modern players would be smashing through the off side." The criticism batsmen cop for getting on the front foot, he says, should be studied from the other end of the crease, "With the bloke who lets the ball go… when do you wear a helmet? That depends on the velocity of the bowler and the pace of the wicket. There is no way you can go on the front foot to someone who is pitching it [short] and it goes [at your] head level." The state of the many technical changes in batsmanship, Wright says, is "more of a commentary not on the batsman, it's on the bowler. Are there a number of fast bowlers around who can bowl at 95 and hurry batsmen up?" "Someone will get seriously hurt." The historically staggered two-man attacks like Larwood and Voce in the '30s, Statham and Trueman, Lindwall and Miller in the '50s and Griffith and Hall in the '60s rapidly burgeoned into a proliferation of quicks all around the world. What happened was less ripple effect, more seismic aftershocks. Brearley recalls Tony Greig taking note of fast bowling and its attendant dangers. "He said, 'Someone will get seriously hurt.'" Brearley, playing for Cambridge, watched a Lancashire bowler called Slacky Hilton at Old Trafford. "He was wild and fast. The pitch was bouncy and [from side-on] it made the ball look even faster. It was frightening." Towards the end of the decade, Greig and Brearley went to meet a Nottingham man who made protective headgear "for children with epilepsy who were often falling". He was to design for Brearley and Greig pink skullcaps with temple flaps meant to protect them from 140kph cricket balls. Brearley wore one against the Australians in 1977. "I thought they would mock it, but in fact, Rod Marsh said at the end of the series that it was the right thing to do, it needed to be much bigger." Amiss' helmet followed a few months later. The fatalities in motorsport, starting with the first recorded death in 1896, are the highest in all sport. Across motor racing - whether drag racing, open wheel, single-seater, touring car or kart - as many as 614 drivers have been killed. From the inception of the MotoGP in 1949, 102 riders have been killed while racing, including 21 rider deaths between 1975 and 1985. There were eight deaths between 1985 and 2015. The Manuel Velazquez Boxing Fatality Collection lists 1865 deaths in professional boxing from 1720 to 2011. The Journal of the American Medical Association lists a degenerative neurological condition - Dementia Puglistica, or punch-drunk syndrome - that affects boxers after their careers. Its newest variant is Chronic Traumatic Encephalopathy, which manifests itself in the early onset of dementia, memory loss, aggression and depression. Three players have died due to on-field incidents in the National Football League, but studies have shown that the game's biggest health and safety issue makes itself felt after the action has passed. Between 2008 and 2010, post-mortem neuropathological examinations of 12 former professional players revealed evidence of CTE, which they had suffered due to repetitive brain trauma. Of the 17 on-field deaths tabulated from 1900, as many as seven occurred after 1990 - due to heart attacks, head injuries or being struck by the puck. The skating blade is capable of slicing through players' faces and bodies. Australia's National Jockey's Trust lists 311 jockey deaths in racing from 1840 onwards. A 2010 Courier Journal calculation lists 150 jockey deaths in the US, Canada and Mexico from 1940 to 2010. Following three jockey deaths in 2013 and a fourth in June 2014, the sport was shaken over the course of three days in October last year when three female jockeys were killed in races. Rugby league is going through its worst year with six deaths since January, four due to on-field tackles, the fifth due to an on-field heart attack, and the sixth of a player who collapsed while training with his team in the west Australian summer. There are 97 recorded deaths in cycling events between 1895 and 2015. Six weeks after getting his jaw broken, Hookes returned to cricket only to find Roberts waiting for him at the top of his mark. Hookes' memory of that moment is in his book. "I still felt jittery but kept reminding myself I was wearing a helmet this time." It was Amiss' helmet, the one that had the crowd chortle, "Hey Amiss, where's your skateboard, mate?" His opponents, though, didn't joke about it, as they too found themselves in the same boat. Amiss' example was followed by Zaheer Abbas, Mushtaq Mohammad, Greig and Alan Knott. Packer was keen to have players use helmets and told Ian Chappell in particular, "I'm not paying you for three months while you are in hospital." There are many stories about batsmen's responses to the arrival of the helmet. Viv Richards never wore one. Barry Richards put on a clunky motorcycle helmet. Sunil Gavaskar's skullcap worn under his white floppy hat turned up later in his career. In June 1978, Brearley told the Glasgow Herald that he was returning to the skullcap, though he believed there were "still good cricketing reasons" for wearing a helmet, the least of which was giving him the confidence to play the hook in practice. Ian Chappell, who like his brother Greg, wore a helmet in only one Test (against West Indies in 1979-80), says, "I wore a helmet [in WSC] to shut [Packer] up but only with the small earpieces on the side. I could never bat with anything in front of my face. I didn't believe I needed it, and I wasn't going to wear anything that might hamper my vision." Greg Chappell thought "the helmet might change my centre of balance. And it was particularly heavy, added to the weight of my head, and I just felt that it didn't actually help me. In fact I had the distinct impression that it hindered my ability to move quickly." The first set of cricket helmets arrived in New Zealand one evening during the Eden Park Test against Pakistan in 1979. The New Zealand openers, Wright and Bruce Edgar, put them on immediately, even though, Wright says, a lot of their peers said "the hell with it". There had been "an element of bravado" in dissing the helmet, but Wright didn't take any convincing at all. "As an opening batsman, you copped a lot of bouncers. Wearing a helmet seemed like common sense." His reasoning was fairly simple: "If you're going to protect your balls, why not protect your brain too?" Wright's helmet once stood between his temple and Roberts, but Rumesh Ratnayake broke his nose as he had neither visor nor grille attached. The helmet gave batsmen a layer of security, but "when you got hit, it felt you were ringing a bell inside your ears. You felt like a guy inside the bell." After being struck on the temple by Roberts, Wright says he couldn't eat "for about three or four days" because his jaw was bruised and sore. "Helmet or not, no one wants to get hit in the head, no matter what they are wearing." Angus Porter, CEO of the Professional Cricketers' Association (PCA), which looks after cricketers at the first-class and international level in England, says, "The introduction of the batting helmets was a significant moment in the sport because it came at a point when people recognised that batting and close-in fielding are inherently risky things to do." Over the years the helmet has opened up diverse ball-striking options enhanced by modern bats and the strike-rate demands of T20. Just as the sudden surge in high-quality pace in the '70s tested defensive foundations, the arrival of the helmet offered batsmen and fielders a sense of security. What has come under a fresh round of examination is the capacity of helmets to continue to offer protection under the stress and strain of geometry-busting batting styles. Under helmets, cricketers are also being asked questions about their ability to deal with and recover from injury. Kieswetter has given his answer: "The trauma and the operations and the uncertainty… I don't want to go through that again… My sight will never be what it was, and after everything that has happened, I've fallen out of love with the game just a bit." "I was a different person there for quite a while." Three weeks before the death of Hughes, New South Wales batsman Ben Rohrer collapsed after being hit by a bouncer at the MCG, struck on the side of his neck by Chris Tremain. He was stretchered off in an open van and diagnosed as having suffered a "heavy and long-lasting concussion". Rohrer says in the first few weeks, along with the dizziness, he "knew" that "I was a different person for quite a while. My personality wasn't the same. I felt like I had to really think about what I was saying and my words, and how to pronounce words, which is a very funny feeling." Concussion in sport is only now being researched and analysed. Strict guidelines forbid team doctors from letting concussed players get back on the field. It is not just the ball that can break a bone or lead to concussion. The human skull is a protective structure of its own, guarding the cerebrospinal fluid and the fist-sized tissue suspended within. The helmet guards the skull but any impact - to helmet or skull - is felt on the brain. After a ball has struck a helmet, a player's head can get "shunted" inside the helmet itself, knocking against the opposite side. Rohrer's concussion, says Peirce, was, in fact, "a minor traumatic brain injury that causes temporary dysfunction in the brain" and "changes the physiology of the brain". Concussion "causes acceleration or deceleration and movement of the brain itself". Porter says the stoic, "strong, silent" male mindset about "carrying on" despite physical or mental trauma was predominant in the past but has changed somewhat. "One of the reasons sport has never historically been good dealing with mental illness is because its view was, 'Come on, be a man. Pull yourself together.' As opposed to: 'There may be a serious issue here. Let us deal with it'." Broad's admission of having problems after being hit on the face by Aaron is revealing. He went out to bat in his next match "nervous but fine" but he told journalists during the World Cup that four months after the incident he began to have "nightmares, when I have felt the ball just about to hit my face in the middle of the night. It has been quite tough". Broad had surgery on his face and is not sure whether the nightmares were the after-effects of post-op drugs. "I would wake up feeling the ball had hit me in the face, which is a bit strange… Even when I get tired, I see balls flying at me." Broad said he has been working with a sports psychologist to shake off the image and "focus my mind on other things". The image of the ball coming at him makes his jaw click into a clench and if he has two glasses of wine he tends to get black eyes. "It is a weird thing to see that ball, thinking you are about to hit it. I still have that picture in my mind and I can remember it clearly. It is a weird situation." If this were to happen to soldiers returning from conflict, it would be classified as post-traumatic stress disorder. A graduate in materials science, Porter has been part of a working group set up between the ECB and the ICC to improve and scale up the standards for headgear. "It is important we all work towards understanding what the next step is," he says. "If we become over-focused on ball injuries to batsmen, we kind of put all our efforts into that, but there are other dangers we need to be concerned about." The other areas of danger are for close-in fielders, he says, especially at short leg and silly point. 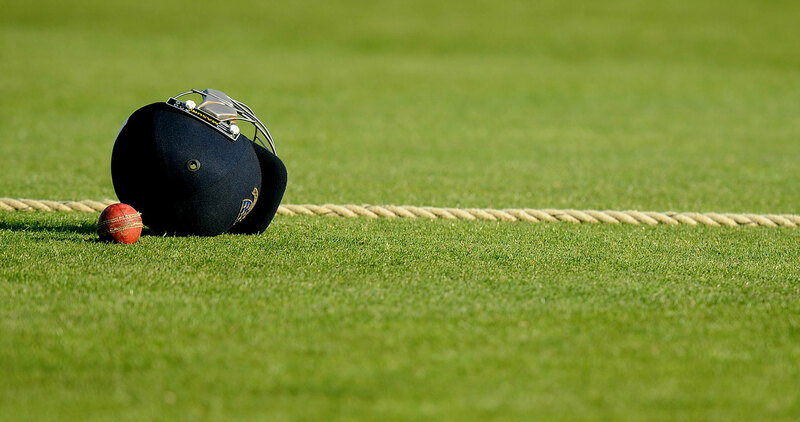 Cricketers and other stakeholders in the England set-up are being consulted as to whether the wearing of helmets needs to be made mandatory in professional cricket, as it is for all cricketers under the age of 18 in the UK. Porter says the mandatory helmet rule would apply to batsmen facing medium to quick bowling, wicketkeepers standing up to the stumps, and close-in fielders. There will also be a discussion on whether the helmets need to be used during throwdowns in training. According to Porter the ECB's "emergency care panel" is conducting a survey of safety standards at county grounds, examining tie-ins with ambulance services and local hospitals. He says the game that was, until very recently, a physio-based sport, must now summon orthopaedics, neurologists, ophthalmologists and surgeons. Cricket Australia has conducted an exhaustive player safety review in the wake of Hughes' death. The absence of body contact may make cricket a "lot safer" than other sports, says Holding, but in the milliseconds between the bowler sending down the ball and the batsman responding to it, cricket comes face to face with its fundamental, latent peril. The Hughes tragedy shook cricket because every batsman and every bowler and every official knew it could have been them involved in the numbing events of that afternoon. "Someone bowling a ball at 90mph, that little five and a half ounces can go like a bullet," says Holding. "It is a dangerous game. It is dangerous if you are batting. It can be dangerous if you are fielding at forward short leg." Cricket must live with this essential, vexing contradiction: for all its Victorian morality about gentlemanliness and lack of contact, its lone point of contact is potentially also its most life-threatening. How safe are modern cricket helmets?